The Cubs marched to spring training victory today, beating the Padres 7-3 in Peoria, AZ. The Cubs were led in their effort by Jason Marquis, the sucky ex-Cardinal who’s having a surprisingly good spring with the Cubs. Marquis is rocking a 1-1 record and a 2.95 ERA this spring. Kerry Wood made his second-consecutive appearance, allowing one hit and striking out two in his one inning of work. 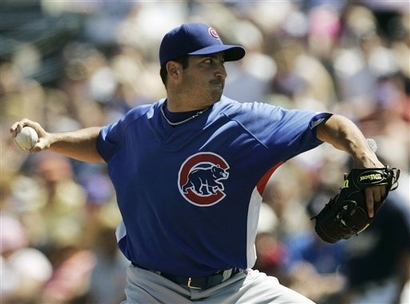 On the other side of the mound was the excellent (in an aggregate sense) ex-Cub who’s having an equally surprising good spring, considering he’s almost 42 and working on season number 22 in the majors, Greg Maddux. Alas, he didn’t have a surprisingly good game, allowing seven runs (two earned) on seven hits and two walks in four innings. Patterson (Eric, not Corey) led things off for the Cubs going 1-for-5 with an RBI. Aramiz Ramirez contributed two RBI. Ryan Theriot brought in three runs, and Marquis himself knocked in a run to bring the total to 7. Adrian Gonzalez hit in all of the San Diego runs and was the only Padre with more than one hit on the game, going 2-for-3 with a run scored. The win brings the Cubs’ Cactus League record to 11-14. Tomorrow the Cubs go up against Jonathan Sanchez and the Giants at 3:05 p.m.
Posted in Chicago Cubs, Game Wrap, NL Central, Spring Training.